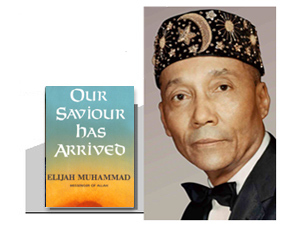 Due to the presence of Allah In Person, (Master Fard Muhammad to Whom Praises are Due forever) and His Aims and Purposes to take over His own, it brings us hourly to a showdown of who shall rule the Nations of Earth. The present world (White people) have had their time and have gone over their time to rule. Nevertheless they still want to rule or destroy the idea of someone else ruling as shown by their preparations made for the total destruction of the Human Family of the Earth. They boast that they can destroy the present total population of our earth 30 times over ... again and again. We know that they will not be able to destroy it one time. But they are preparing to do so should they be given the chance. This is very hard for you to listen to or accept from a man who stands at your door telling you that he is prepared to destroy you again and again and blast you out of your own house. We are now told in many skillful and deceitful ways that the White world is prepared and is putting those preparations into action against the Black Man. The earth actually belongs to the Black Man. This is made clear in the Bible and Holy Qur'an. The prophetic sayings of the prophets for 4,000 years from Moses have constantly warned the present rulers (White) that the day of showdown was coming and that the world belongs to the Original Owners (Black Nation). The White race was given a limited time (6,000 years) to be the overlord (White) of our earth and ourselves. He is well aware of it (time). The White man is well aware that he does not own the earth and that he had no part in its creation. The scientists of the White race well know this, but, nevertheless, as it is written (Bible) Jer. 49:21, we see that today trouble is brewing everywhere; even between Black and Black where it should not be. But where Black wants to live with White and does not want to take his responsibility to go for self, Black has trouble with Black due to this desire. Integration is against the Desire and Will of God Who Wants and must Do that which is written He Will Come and Do: Restore the earth to its rightful owner (Black Man). The White world, as it goes out, has not been asleep to its responsibility. They have been building up their arms and arsenal and factories for this day, in order to kill the Black Man. They are doing this in so many ways with drugs and the surgeon's knife in the hospitals. It is the greatest desire of the White man that he does not leave the Black Man in position to keep populating the earth under his own color. Our women are the target. They want to stop them from bearing children. Millions of our women fall for this destruction of their race. The Black Nation is under the Guidance and Guardianship of our God, the Great Mahdi, He is The Restorer, The Defender of The Black Nation. He Will Restore and Defend us. There is nothing that the White race can think of in this day and time that is not already known by the God of the Black Nation. Therefore, the showdown will be victorious on the side of the God Who Knows what we think and plan. He has power over us and over the atoms of the atmosphere. The attacker would have no power whatsoever to defend himself in a showdown against such a Wise and Powerful God, The Great Mahdi. The Great Mahdi has and exercises power over everything of the creation carries or brings forth power. One would be silly and greatly the loser to attack such a God. But nevertheless the world must see a showdown between the two Gods. His Eyes and Ears are ever Open in both camps ... the wicked and the righteous. So these two worlds draw nearer and nearer together for a showdown. The American Black Man is to be warned and he is warned of this showdown which is coming between the two worlds. He should fly to God (Allah) of his people Who Has Power to save them. My work, to bring you into the knowledge of Allah (God) and the God of your fathers and the knowledge of the power of that God and to ask you to accept your own, has been given to me. The Black God is well able to give you your own. Fly to Him, I say. Fly to me and I will guide you to Him as you do not know Him. If you do not know, seek to know. I will teach you to know. To reject your share in the earth and the universe which is rightfully your own would be such a foolish act that it could never be blotted out of your future history. Come Follow Me, I say. I will lead you to your God of Salvation. If you stay where you are, you will suffer the consequences. Just as a reminder, read the Bible Jer. 50:46 and II Pet. 3:10. It is terrible, awful, and frightful, to look up and instead of seeing a blue sky, see a sky of flames and fire. This will surely come. Allah (God) has affirmed this prophecy with me. The whole heavens will be blotted out and in its place there will be a canopy of flame. The heavens and elements that make up the atmosphere of the earth will melt with fervent heat. There will be an explosion of the total atmosphere of the earth by God Himself. Take Heed of it, for the Holy Qur'an says such a time as we are entering into now is a grievous time. It will make children's hair turn gray. If the grief and excitement will make children turn gray because of the terribleness of judgment, what do you think our hair will be doing? The Bible prophesies gray and baldness upon all heads. My people, stop thinking of sport and play and think over your life and the safety of your life.